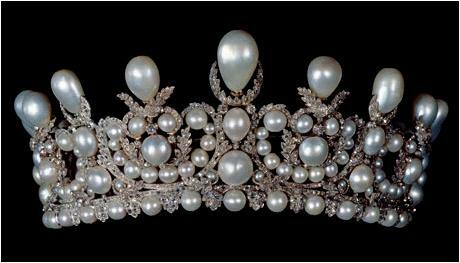 This tiara might be the most famous of the surviving French crown jewels - at the least, it's pretty well known for a tiara that is not currently worn by a royal, I'd say. 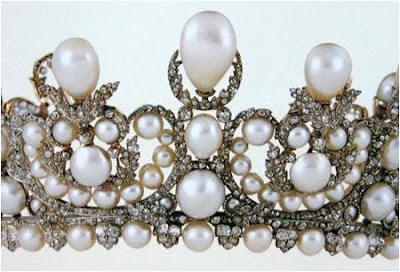 The pearl and diamond tiara made for Empress Eugénie contains 212 pearls (weighing 2,520 grains in total) and 1998 diamonds (with a total weight of 63.3 carats). The diamonds create a leafy scroll pattern around the multiple larger pearls, and the tiara finishes off with multiple upright pear-shaped pearls of graduated sizes. 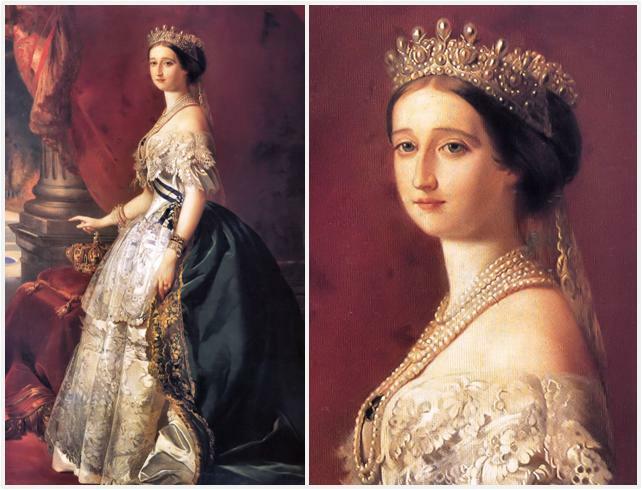 The tiara was made by Gabriel Lemonnier around 1853, and was commissioned by Napoleon III to celebrate his marriage to Eugénie de Montijo (1826-1920). But as was the tradition with the French crown jewels (and as we've seen previously with both ruby and emerald tiaras), the gems had been reconfigured by various users throughout multiple shifts of power in France at that time. These pearls and diamonds belonged to the French state treasury and had previously been incorporated in jewels used by Empress Marie Louise (1791-1847, second wife of Napoleon I) and the Duchess of Angoulême (1778-1851). The new tiara fashioned for Eugénie was part of a parure including bracelets, a stomacher, and a necklace of six pearl strands, and was worn by the Empress for a portrait by Franz Xavier Winterhalter. 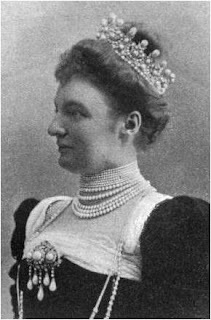 Having used existing jewels from the state treasury, the tiara was not Empress Eugénie's personal property and was returned to the state when she left France for exile following Napoleon III's 1870 defeat. It remained with the rest of the crown jewels until the Third Republic decided to sell the lot in 1887. It was bought at auction and then sold again to Prince Albert I of Thurn and Taxis, who bought it to give as a wedding gift to his bride Archduchess Margarethe Klementine of Austria in 1890. The tiara remained with the Thurn and Taxis family for the next century, passing to Albert I's son Franz Joseph, then to his brother Karl August. Karl August gave the tiara to his daughter-in-law Gloria when she married his son, Prince Johannes, in 1980. 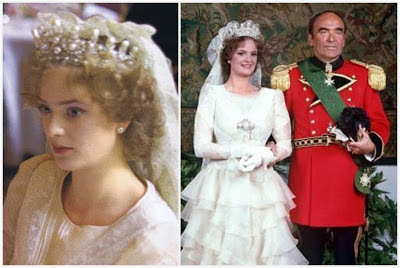 Gloria memorably wore the tiara on her wedding day. Princess Gloria made a name for herself as the "Punk Princess" and "Princess TNT" in the 1980s, combining the magnificent jewels of the German princely family with an attention-grabbing array of outrageous outfits and hairstyles. But the party stopped in 1992, when Prince Johannes died and Gloria had to act to preserve the family fortune from debt and inheritance taxes. Among her actions was the sale of quite a bit - not all, though - of the family jewel collection. Empress Eugénie's Pearl and Diamond Tiara was sold for 935,000 Deutsche Marks. The tiara did not disappear into a personal collection, though: it was bought by the Friends of the Louvre, who handed it over to the famous Paris museum where it joined other recovered pieces such as the Duchess of Angoulême's Emerald Tiara. We can see it, though we can't see it worn - a happy medium considering the other options, I suppose. Is this your favorite French royal tiara?